Rule with love, and not an iron fist, in ngmoco's kingdom builder. We Rule, from iPhone App publisher ngmoco, is a casual game where you build a kingdom and invite friends to visit and vice versa. 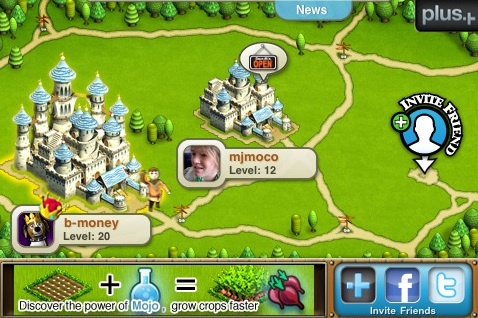 Similar to the hugely popular Facebook game, Farmville, there are no bosses to destroy or levels to complete. Instead, you earn experience through planting crops and earning cash by selling items that in turn allow you to expand. Well made, user friendly and attractive, it's bound to find an audience hungry to live like a king. At the outset, ngmoco gives you a plot of land and just enough to get going. From there, it's all about raising whatever crops you can find, such as peppers, rice, watermelon or carrots, among others. Each crop has a unique growing time, allowing you to harvest stuff at different periods; strawberries, for example, take an hour and a half. Thankfully, you can acquire something called Mojo that accelerates growing. 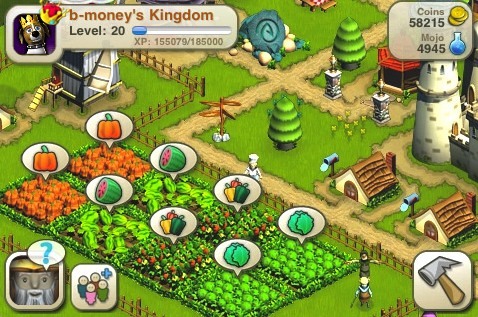 Harvesting crops earns coins that let you construct different types of shops that specialize in different tasks, such as baking or bundling wood. From there, you can invite fellow players (through ngmoco's plus + network) to check out your kingdom and place orders for goods and services, which results in additional cash; buying wood, for instance, lets them build things. Each transaction yields valuable experience for both parties, so there's a fun incentive for both business owner and customer. Obviously, no one will slap you on the wrist for having a small kingdom, but We Rule is all about expansion. Eventually, most gamers will want a larger castle and more businesses to get the most from the experience. Clearly, the goal is to dream big and then get whatever you want. As for the visuals, We Rule's 2-D graphics sport non-player characters going about their business, attractive buildings and of course, elaborate fortresses. And if you want to get a lay of the land, user-friendly touch controls let you examine the kingdom by dragging a finger across the iPhone's screen. From what ngmoco told us, We Rule was designed with bite size play sessions in mind, allowing players to get their fix wherever they are. That should bode well for iPhone gamers hungry for a little micromanagement on the go. We'll post new details about this intriguing App in the near future.